...nachdem ich ja ursprünglich glaubte, daß ich das nicht hinbekommen würde. Aber es war echt einfach und gar nicht viel Arbeit. Aber die Häusschen sind ja so winzig*gggggg. Aber total süß. Es wird nicht das einzige seiner Art bleiben! Die Anleitung dazu gibts übrigens hier! 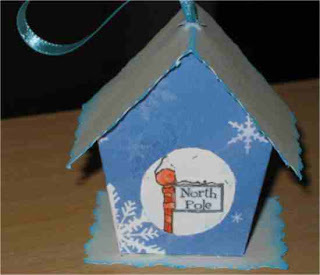 ....and I did craft such a super-cute birdhouse...long time I thought I would not be able to work out this one. But it was not difficult at all and it was not much work! But these little cuties are sooooooo small*ggggg. But totally gorgeous! It will not be the only one for me! Surely not! Here you can see, how such a little birdhouse is done! Das ist ja richtig niedlich.Ich werd mich da auch mal ranmachen. Wooow,das sieht echt toll aus!